Shirley Schmidt and Denise Bauer represent two groups of parents, one Christian and the other Wiccan -- a pagan religion -- who are suing to stop the Halloween pageant in their children's public school. The Christians feel the pageant is a violation of the Establishment clause of the First Amendment, and the Wiccans claim that Halloween images libel them by presenting a negative stereotype - especially after the school's principal gives a riveting demonstration of her cackling, green wicked witch. Meanwhile, Alan Shore sues the U.S. government on behalf of a client in order to vindicate the death of her brother who was killed in the Iraq war. Shore's friendship with Denny Crane is threatened by this unconventional case since Crane strongly feels that citizens shouldn't criticize the military while the country is at war. Both of the cases in this episode of Boston Legal are based on actual lawsuits. 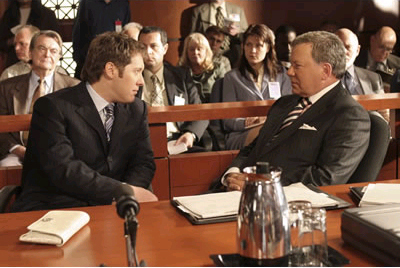 Consulting your textbook, notes, and the articles on the Establishment Clause, Libel, and Sovereign Immunity, discuss the cases argued in this episode of Boston Legal. If you were the judge in each case, would you find for the plaintiff or the defendant? Why, and what would be the Constitutional justification for your decision?